Due to its location in Bay of Bengal, far off the southern coast of India, there are only two possible to reach the pristine and beautiful Andaman Islands, either by air or see. As Andaman and Nicobar Islands are included in the seven union territories of India, Indians do not need a visa or any permit to fly there but are required to carry the documents supporting their nationality. But same is not the case with people of other nationality and they do need to carry the permit along with other documents. Flights are certainly more fast and comfortable and perhaps more preferred option by the visitors. Ships are certainly cheaper, but they can take up to 2-4 days to take you to Port Blair. Also, the timings can be delayed for arriving at Port Blair which is very common, and schedules are re arranged time and again, depending on the ship company. Booking process is also full of hassles as bookings can only be made from Kolkata, Chennai or Vishakhapatnam. One would prefer ship only if they’re looking for some distinguished kind of adventure. By Air – Flights from Chennai and Kolkata fly directly regularly to Veer Savarkar international airport in Port Blair and these both airports are the most preferred boarding point for most of the tourist planning to visit Andaman and Nicobar Island. There are also direct flights from Delhi, Mumbai and Bangalore. And on some fixed days, flights from Vishakhapatnam ply as well. Flights from Kolkata and Chennai take up to 2 hours to reach Port Blair. And from Delhi and Mumbai, it can take up to 5 hours for a nonstop flight to reach Port Blair. Nearest Airport: Veer Savarkar Airport at Andaman is named after the great Indian freedom fighter who imprisoned in the infamous cellular Jail during India’s first fight for independence from the British. The Airport at Port Blair is 31 km away from Andaman and Nicobar Islands and it takes about 40 minutes to reach there by car. Expect flight fares to cost you anywhere around ₹7,000 one way from Kolkata and Chennai, while it can cost up to ₹10,000 from Delhi and Mumbai to reach Port Blair, Andaman. By sea – There are three to four ships that sails from Chennai and Kolkata every month towards Port Blair. There is one more ship that sails from Vishakhapatnam but only once every month. 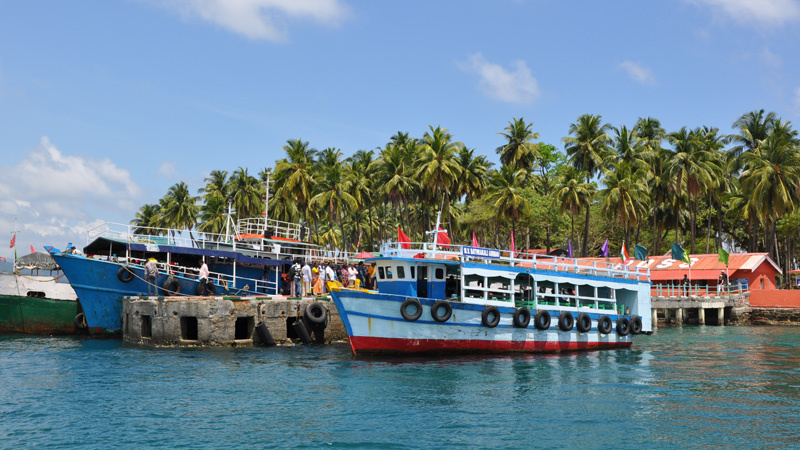 The voyage takes about 3-4 days and can be a tiresome journey with some common delays in arrival timings for Port Blair. The ships usually berth at Port Blair for about two to four days. Ship schedule – Usually sailing schedules are announced one month prior for the Mainland-island sector, 5 days prior for the inter-island sector (for the southern group of islands i.e. Port Blair – Nicobar, Nancowry, Katchal, Campbell Bay) and 3 days prior while travelling to foreshore sector (Port Blair – Mayabunder, Neil, Rangat, Diglipur, Havelock and Hut Bay). Tickets can be booked for any of the above voyage through a single window ticket booking system for any scheduled sailing at the STARS (Ship ticketing advanced reservation system) counters of the directorate of the shipping service, A&N administration at Chennai, Port Blair, Diglipur, Rangat, Mayabunder, Car Nicobar, Havelock, Hutbay, Campbell Bay and Nancowry. 1. Shipping Corporation of India Ltd.
2. Shipping Corporation of India Ltd.
3. Shipping Corporation of India Ltd.
6. Shipping Corporation of India Ltd. In Kolkata, The STARS network is located in the Shipping Corporation of India and tickets are sold here. And currently, Vizag-Port Blair sector is not under STARS networks. And if someone wants to buy a ticket from Vizag, there are ticketing agents who can help. One need to submit the application form in order to book the tickets and produce ID proof at the time of boarding the ship. So, it is advisable to carry all the identification documents as it can be needed anywhere.